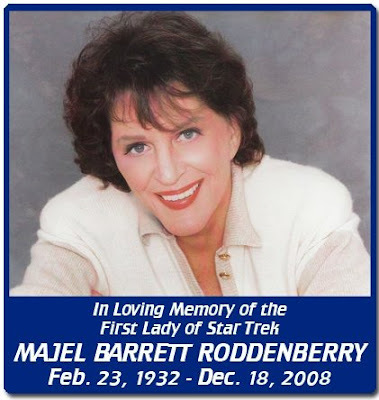 From TrekMovie.com we get this sad news; Majel Roddenberry, wife to Gene Roddenberry, who appeared in every Star Trek series and every movie, even the pilot episode where she played "Number One", has passed away after a short battle with leukemia. Majel also played Nurse Chapel in the original series, the computer voice in all Star Trek shows, and Lwaxana Troi in NG and DS9. Apparently she also appeared in '50s shows "Bonanza", "Leave it to Beaver" and "I love Lucy", but certainly her fans will remember her for her Star Trek roles. According to TrekMovie.com she had completed her role as the computer in the upcoming Star Trek movie, so it sounds like we will get one more performance before she is gone forever.